Some flies, known as phorids, specialise in decapitating ants in a gruesome way. They lay their eggs inside their victims. When the maggots hatch, they move towards the ant's head, where they gorge upon the brain and other tissues. The ant stumbles about in a literally mindless stupor until the connection between its head and body is dissolved by a enzyme released from the maggot. The head falls off and the adult flies burst out. There are hundreds of species of phorid flies, each one targeting its own preferred ants. But some ants are naturally defended against these parasites because they're incredibly small. Most phorids are a few millimetres long. If an ant is the same size, its head wouldn't be roomy enough for a developing fly. Thailand, for example, is home to an acrobat ant (Crematogaster rogenhoferi) which can be just 2 millimetres long. Surely these workers are safe from decapitating parasites? No, they're not. Brian Brown from the Natural History Museum of Los Angeles County has just discovered a Thai phorid that's just 0.4 millimetres in length. It's the world's tiniest fly, small enough to sit comfortably on the eye of a common housefly. It's easily small enough to fit inside the head of even the smallest acrobat ant. It just goes to show that there is no way of truly escaping from parasites. If you evolve a miniscule body, they will shrink even further in pursuit. Brown's discovery came through a project that aimed to catalogue new species of Thai insects. After three years of collecting samples, he found a tiny fly that he could barely see. "Some of the flies I work on are small — down to half a millimetre or so — but this was really small," he says. "I knew it was weird, but finding something weird in Thai samples is not extraordinary. But I wondered if it was the smallest fly in the world." It was. 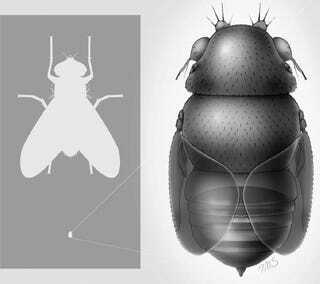 Even though flies as a group aren't exactly giants, the new species was around half the size of the previous smallest species. Brown named it Euryplatea nanaknihali after Nanak Nihal Weiss, a young boy from Brown's home town in Los Angeles. Weiss is an entomology fanatic and Brown hopes that the name will help to keep his interest for years to come. Brown is sure that his new discovery is a parasite. Its abdomen ends in a hard, pointed egg-laying structure, which it uses to pierce the weak membranes of its victims, between their armoured plates. Those hosts are almost certainly ants, since E.nanaknihali's relatives all decapitate ants, and its closest cousin is a tiny phorid from western Africa that targets acrobat ants. Brown found that there's a strict linear relationship between the size of different phorids and the size of the ants they parasitise. Based on that, he predicts that his new species beheads ants that are 2 millimetres long. In Thailand, only one ant fits the bill — C.rogenhoferi, the smallest one around. But so far, no one has actually witnesses the fly's parasitic behaviour, since only a few specimens have been found. We know next to nothing about this tiny beheader, but its unusual shape provides a clue. E.nanaknihali looks quite unlike a typical fly. Its body is squat and pebble-like, and its wings are stubby and smoky grey. "It's a totally bizarre little thing — almost like a horseshoe crab in shape," says Brown. He thinks that it's probably a defensive measure. "It probably lives part of its life inside the ant nest," he says. "They have to hunker down to avoid attack." Small though E.nanaknihali is, it is at least twice the size of the world's smallest insects. All of these record-breakers are wasps, and they're smaller even than single-celled amoebas. They're also parasites, which lay their eggs inside the eggs of other tiny insects called thrips. There's an entire world of miniaturised body-snatching going on beneath our notice. This post originally appeared on Not Exactly Rocket Science.